Seriously though. 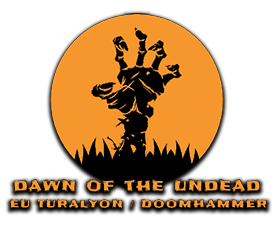 Dawn of the Undead has some simple rules to follow; keep language in guild chat mature, listen to the officers and respect that their decisions is final, try to be helpful and friendly and you will notice how that makes people nice and friendly to you, don’t beg for gold or try to sell stuff in guild chat, also don’t expect people to boost you through instances, if you help others a lot they are likely to help you. That is also the best advice if you want to climb in ranks. Cheerleader is the ALT rank for everyone except officers. Adventurer is a standard membership rank and gives limited access to guild bank. Warbringer is the rank for those committed to the raids organised by the officers. This includes being on time, prepare with pots and food, getting proper addons and keeping a team player attitude. Decent level of performance and knowledge of the fights is expected. We want to be able to bring our raider ranks to all of the content we are doing, this means also Mythic raiding. Conqueror is a higher tier of raider, whos behaviour, helpfulness, class knowledge, skill and performance, stands out in PvE environments. Also expected to have good knowledge of the fights and a good attendance to keep the rank. It's just another raider with a fancier name. Mini Moo is the ALT of an officer. Medium Moo is the officers. Chief Moo GM is just another officer with a fancier name. Your alts are more than welcome in Dotu as long as there active and not just sitting there gathering dust. Members of the Adventurer rank or below may change their main character, but with permission from the officer staff. Switching main character for members with the Warbringer rank, or above, can prove more troublesome, as it may have an impact on raid gear / progress and has only been allowed in a handful of case's. If you think switching your ALT to your main character is a good idea because you've geared your main up, then think again, this has a very negative impact on the raiding group as instead of gearing 35 or so raiders, that number increase's at no gain to the overall raid group. If we are short on particular roles, then selected ALTs may be required to attend raids in place of your main. This does not mean that a player has 2 active main characters, but is simply filling in the gaps in the raid setup.